101 Reasons Why We Chose Memoria Press for Our Classical Homeschool Curriculum - The Kennedy Adventures! What started out as an experiment has been a complete paradigm shift. Homeschooling, especially with a classical approach, has paid off so very handsomely for our family, in ways I couldn’t have imagined. It’s strengthened our family relationships, deepened our faith, and encouraged me to keep learning, right alongside my children. 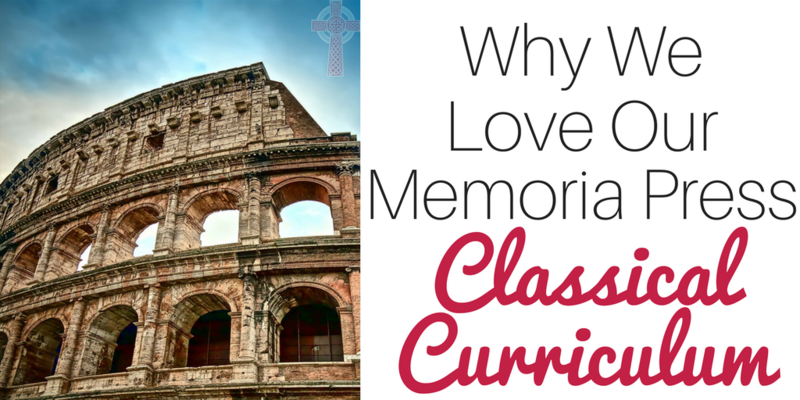 I am so very thankful that we’ve been on board with the Memoria Press Classical Curriculum all these years. 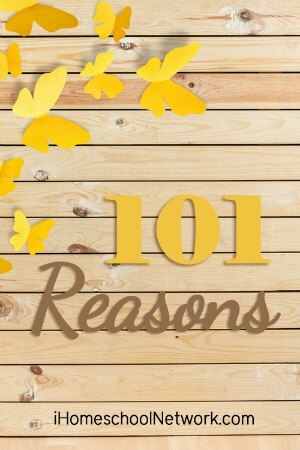 Grab your coffee, settle in, and I’ll share 101 reasons why. With Memoria Press, all of the planning work is already done for me. I don’t have to research different options, write lesson plans, etc. Just a day organizing all of my materials, and I’m ready to go. MP gives me confidence — if other homeschooling moms mention a program that works for them, I just smile and nod. I don’t go home and look up anything, because I’m satisfied with how well it works for our family. MP is easy to customize – I know many families who substitute a different math, a different writing package, or just pick a few MP subjects to use in their homeschool. Bottom line? You can be all in, like our family, or single out a few areas in which to use MP. Let’s be honest. I vacillate back and forth between being a drill sergeant and throwing my hands up in the air and letting my kids eat cotton candy all day. MP provides me the right amount of structure and rigor to keep our days running along. Even though MP is structured, there’s room for flexibility, too. We lean towards more of a year round approach with our homeschool because of my work schedule. MP’s clear focus helps me to look ahead and adjust the schedule, scope and sequence to fit our family’s needs. It doesn’t take all day. See above. You won’t see lesson plans stuffed with unnecessary drivel. Everything has its purpose, and like Goldilocks, it’s just right. MP saves me time and energy. I COULD spend weeks pouring over different selections for reading, math, history and composition. But for me, that’s time that could be better spent on a hike with my kids, or reading a book for my own pleasure. Having the guideline from MP makes my path so much smoother, and saves me all the guesswork. MP has simple, easy to use Teacher Guides. Nervous about teaching Greek Myths? Don’t sweat it. The teacher guides are laid out logically, with everything you need to know to teach the topic at hand. Outside of gathering my materials (they can get a little scattered with lots of little people around), and some time perusing the teacher guides, our MP subjects are fairly open and go. Many of the classes are set up similarly (Classical Studies and Christian Studies, for example), and once you get a handle on the rhythm of the class, you’re golden. One of my very favorite pieces of the MP curriculum is the Curriculum Manual, or the lesson plans for each grade level. Each and every day is laid out for you, in an easy to digest format. Want to move toward a 4 day school week? No problem. Take a look at the week laid out in the Curriculum Manual and see what items you can shift around a bit. Your days might end up being a smidge longer, but you’ll build a day off into your week for appointments, errands or field trips. Time for a confession — I’ve taken some flack from people because we don’t use an ‘official’ Catholic curriculum in our homeschool. For me, I’ve seen nods to Catholicism throughout our MP experience. 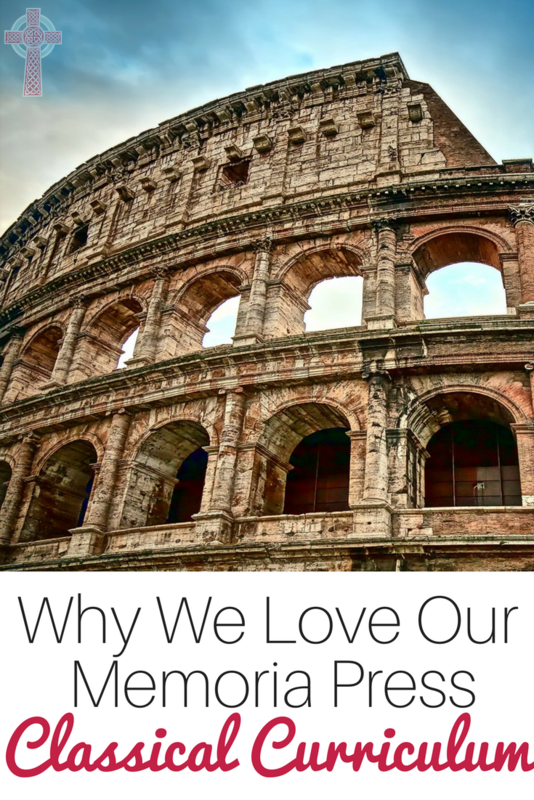 We’ve learned the same prayers and songs we sing at Mass in our Latin classes and dove into studying some of our most beloved saints during Famous Men of the Middle Ages. (St Benedict, St Joan of Arc) Rachel even starts her day at the Cottage School with a prayer from St Ignatius. It’s easy to streamline when necessary. If you take a peep at the MP website, you’ll see some grade ranges on some of the products. (Classical Studies, Latin, Christian Studies and more) With larger families, it’s easy to combine students in different grade levels for one class. The customer service from MP cannot be beat. These folks are so helpful, so kind, and they tailor their plans to the needs they hear expressed in the homeschool community. Don’t have time to read? Peruse through the CLSA webinars and sign up for their newsletter. These are designed for educators in classical schools, and I see many of my MP momma friends in the chat box when I get to watch. It’s filled with AMAZING literature selections. From the beautiful preschool program, all the way through senior year, the Memoria Press curriculum is filled with incredible literature. We’ve devoured adorable picture books, poetry collections, novels, and look forward to Shakespearean plays on the horizon. What about you? Have you used Memoria Press in your homeschool? Share your reasons why, and I’ll add them to the list! Hi, I’m wondering if you could tell me more about this decision. I’m currently fip flopping between Memoria Press and Mother of Divine Grace.